Carinya Homestead is nestled on a magnificent 100 acre working olive grove of River Flats Estate in beautiful Broke Fordwich, Hunter Valley NSW. Carinya is the largest home on the property surrounded by stunning olives, wineries and Cellar doors. Broke Fordwich is just a short drive from Pokolbin and all the yearly events. 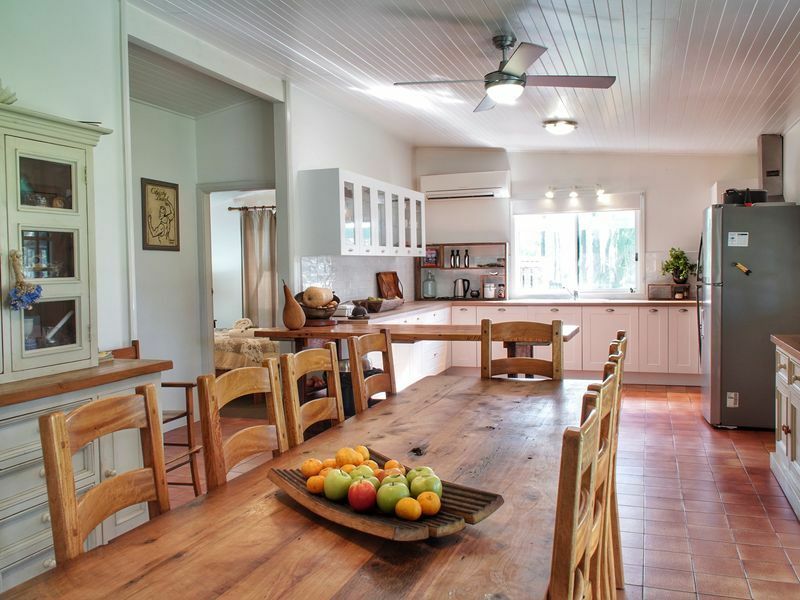 Carinya offers farmstay accommodation suitable for large families, groups and functions. River Flats Estate is great for kids, visit the animals and our own retail store. * A deposit of 50% of the total rate is required by to secure the booking. Deposits are not refundable. * The outstanding balance is due 14 days before your arrival date. * A security deposit is required before your arrival and is fully refundable if the house and their contents do not suffer damage or loss or require excess cleaning. * Weekend Public Holiday bookings must be for a minimum of 6 or more guests and are 3 night stays only. * Easter, Christmas and New Year are a 3-4 night stay and charged at full weekend rate. Marion the owner was most helpful and provided us with a hamper which helped us with supplies as we arrived late in the evening. The fire was going which made us feel welcomed as soon as we walked in. We were a group of crafting fanatics who loved the home and found it very comfortable to do our craft. The beds were comfortable and the view from the house was breath taking to wake up to. Great view perched on the hill overlooking dams and olive groves. We were disappointed in the homestead, found the lounges old and very musty with smelly scatter cushions. The homestead was full of the owners stuff with no room to pack the vacuum cleaner and other stuff away because all the cupboards were full. Even the wardrobe in our room was full of stuff. Lovely big stove in the kitchen, but the oven was filthy, crumbs all over toaster top and also on kitchen bench top, Dirty dishwashing cloth. Dirty windows and screens. We are not fussy people and have stayed extensively in holiday accomodation throughout Australia, some old, some new, but we do expect a clean environment. Still we enjoyed our stay and made use of the great outdoor facilities offered. Home from home - didn't want to leave..
Lovely spot - perfect for family getaway. Hosts were great. Lovely setting. Outdoor area was excellent. Hosts set up the Pizza oven for us on arrival so we could make our own pizzas. We were given access everywhere so could walk around and see the farm animals. So relaxing. Most of all we felt we were visiting a family as friends not "holiday accommodation"
A group of friends caught up for the Easter weekend and stayed at Riverflats. The location was amazing from a view perspective (which was stunning) as well as a geographic perspective, right in the middle of the wineries. I would highly recommend this place for groups or families wanting to find peace in the country but easy access to amazing boutique wineries. What an incredible estate and great hosts! An incredibly comfortable home for 8 of us who took advantage of the beautiful views with the sun beaming every morning. We had trouble lighting the fire and Sara was more than helpful when she set it up for us so we could make our own pizzas. Sara also gave us information on the area (as there's no signal-perfect to get away from city life for a weekend). Carinya is a wonderful property that I couldn't recommend highly enough if you are looking for a proper country retreat in the Hunter Valley. The property is massive and very well equipped for all types of activities. The owners are incredible and really made us feel like we were at home. So many good things I could say about this place but I will leave it to you to discover them all. Can't wait to go back. Thanks Marian (and everyone else) for a wonderful stay.